With spring rapidly approaching, many farmers are getting ready to plant the crops that they’ll harvest this summer and fall - which got me thinking about CSAs. CSA stands for Community-Supported Agriculture, and it’s a great way for consumers like you and me to get a great bounty of fresh, local goods while supporting farmers in our own communities. Here are the basics: a farmer offers a certain number of "shares" to the public. 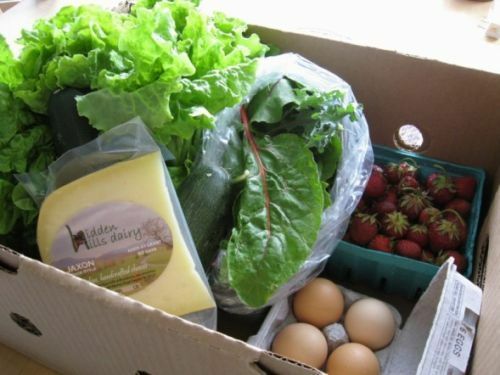 Typically the share consists of a box of vegetables, but other farm products may be included. Interested consumers purchase a share (aka a "membership" or a "subscription") and in return receive a box of seasonal produce each week throughout the farming season. What’s in the box will vary depending on the farmers involved in each CSA. Here at Eat’n Park’s Corporate Support Center, we participate in the Penn’s Corner CSA. Penn’s Corner is a cooperative of over 30 local growers, including some of the farms that supply Eat’n Park restaurants with fresh fruit and produce. Because Penn’s Corner is comprised of so many different farmers, our weekly boxes contain not only a wide variety of local herbs, veggies, and fruits, but also the occasional jar of honey, pack of fresh pasta, gourmet mushrooms, local cheese, or free range eggs. But Penn’s Corner certainly isn’t the only CSA available in this area. Last Friday, I was out visiting farms when I came across Janoski Farms in Clinton, PA. This farm has been in operation since 1890, and currently includes thirty-five greenhouses, a retail farm market, a farm bakery, a garden center, orchard, gift shop, country restaurant and over 200 acres of vegetable production. The Janoski’s recently decided to start a CSA, which will run from June through November, and will take advantage of the many vegetables and fruits already grown on the farm. In addition to enjoying fresh, local produce, another great benefit to CSA membership is the opportunity to try vegetables that you otherwise wouldn’t have considered. Many CSAs, including Penn’s Corner and Janoski’s, provide recipes that incorporate the week’s bounty. You may just discover a new favorite meal! Penn’s Corner and Janoski’s are just two of the many CSA programs available in this region. To locate a CSA near you, or just to find out more about CSAs in general, I recommend that you visit http://www.localharvest.org/csa/. Just put in your zip code to see a listing of all the CSAs available in your area. An example of a weekly share from Penn's Corner CSA. Hop in to Eat’n Park for your Easter goodies! Salad Bar Coupon Savings at Eat'n Park!